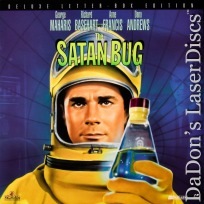 The Satan Bug 1965 - 114 min. 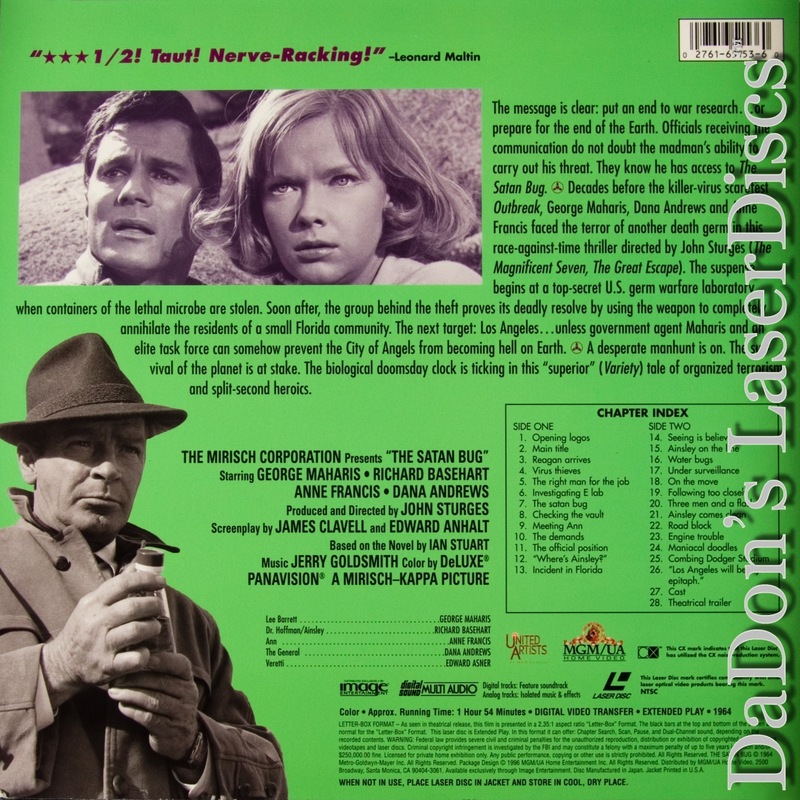 - Color Genre: Thriller Not Rated Country: USA LaserDisc Movie Review: John Sturges's adaptation of Alistair MacLean's sci-fi novel stars George Maharis as government investigator Lee Barrett. When a flask bearing a recently discovered virus, the Satan Bug, disappears from a top-secret biological research laboratory along with several flasks of a botulinus organism, Barrett is assigned to investigate. 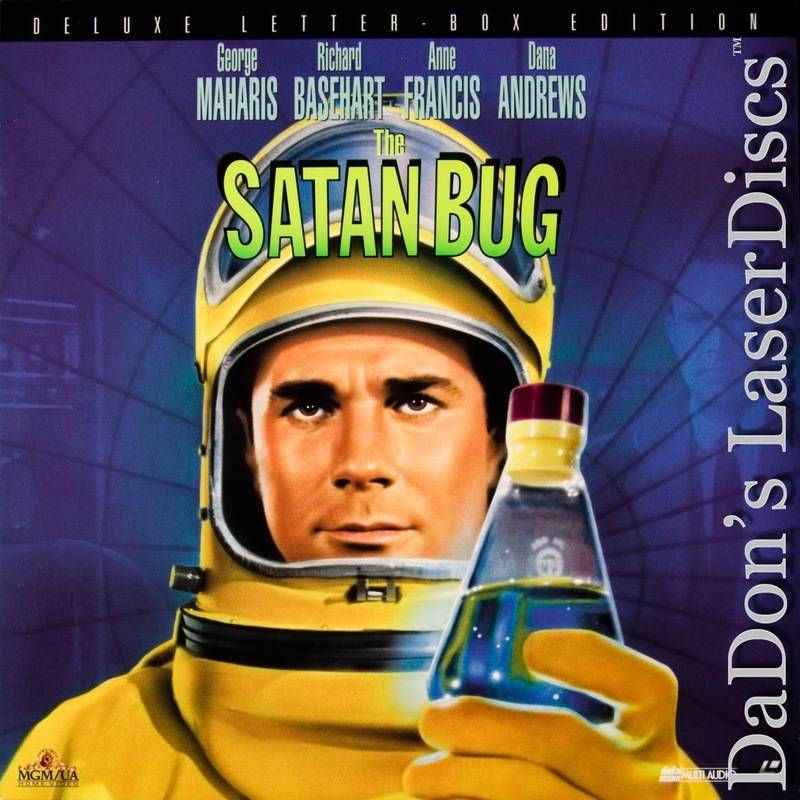 Briefed by the general (Dana Andrews) in charge of the investigation and one of its developers, Dr. Hoffman (Richard Basehart), he learns that the Satan Bug is so deadly that it could possibly set off a chain reaction that would wipe out all life on earth. At length, Barrett discovers the whereabouts of the stolen virus, but he and the general's daughter, Ann (Anne Francis), are hijacked by Veretti (Ed Asner) and Donald (John Larkin), henchmen of unseen millionaire Ainsley, an unsavory character who intends to use the virus to take over the world. To demonstrate the seriousness of his threat, Ainsley's accomplices unleash a bit of the botulinus on a small town in Florida, killing all its inhabitants. Ainsley then threatens to destroy the entire city of Los Angleles with another flask of the lethal organism. Both MacLean and Sturges take a detour from the hypermasculine world they do best, turning this interesting premise into a noble melodrama. Thanks for Visiting DaDon's Rare LaserDiscs ! Reviews, Articles, Newsletter and Information for Movies on LaserDisc LD Laser Disc, LazerDisc.